The most common reaction to our 72 seat theatre is surprise and admiration at the sheer quality of the production. The stage area may be small but the dedication, enthusiasm and professionalism is high. We have a loyal audience who tell us what they like and we listen! We are not afraid to be innovative and 2010 saw the audience surrounding the actors on all four sides as they watched ‘London Suite’ by Neil Simon in a theatre-in-the-round production. Another audience response inevitably is around the friendly nature of the theatre – the building itself and the front of house staff who will soon learn to greet you by name! People feel welcome and at home here very quickly and this allows openness between audience and group which is invaluable in planning future programmes. It’s hard to imagine what the North East was like as the Second World War drew to a close. No doubt people were war weary, sick of shortages and looking to a better future. So it was that in September 1945 two local well-known amateur directors and actors, George Sylph and Hilda Perridge held a meeting and the group was formed. The first production was ‘The Admirable Crichton’ by JM Barrie and all profits were given to the Boldon Welcome Home Fund for returning troops. Rehearsals for this and productions for the next few years were held in people’s homes and the Old Ship Inn (now demolished). Some very fine plays were produced and performed in various venues. But by 1948 the group had set up a Development Committee to raise funds for CVDC to have its own premises and the present site on Boldon Lane, in the middle of Cleadon was purchased in 1951. The actual building was originally a redundant separate office in one of the Sunderland Shipyards and was transported to Cleadon in 1952 and what a sight that must have been in those days! We understand that the fine wood panelling in the auditorium was once used in an ocean going liner. 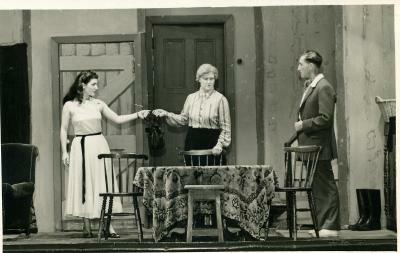 In the 1950s the building was mainly used for set building and store, social activities and in-house productions. Plays were mounted in the Village Hall and the Pier Pavilion, South Shields but by 1969 it was decided to perform the major productions in the building itself and the present intimate theatre came into being. Improvements continued with a Green Room Extension five years ago and in 2010 we added extensions to the dressing room area. The one thing that hasn’t changed is the enthusiasm to mount some quite ambitious plays, serious classics, comedies, thrillers and mysteries. Click here to visit the Archive Page and see some photographs from 1940’s onwards plus the programme of our very first production of The Admiral Chrichton by J.M Barrie in December 1945. Unfortunately no photographs of this production have survived.